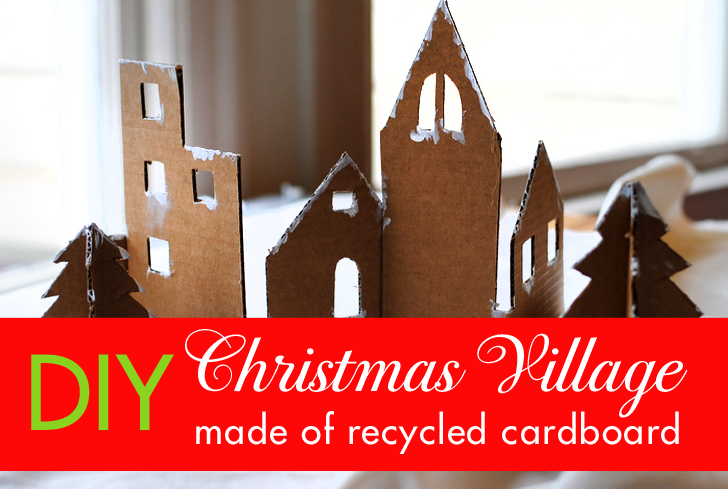 All those cardboard boxes you receive during the holiday season can be easily upcycled into a fun, architectural Christmas decoration! 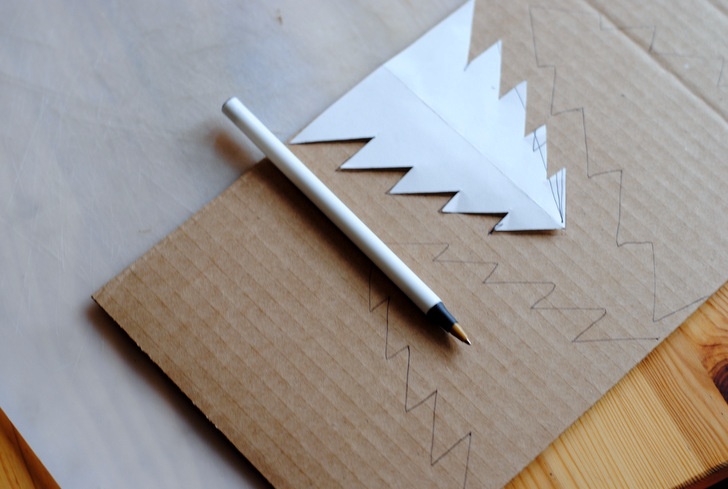 this project is easy to make with kids (if you help out with the sharp cutting tools! ), or even at the office. 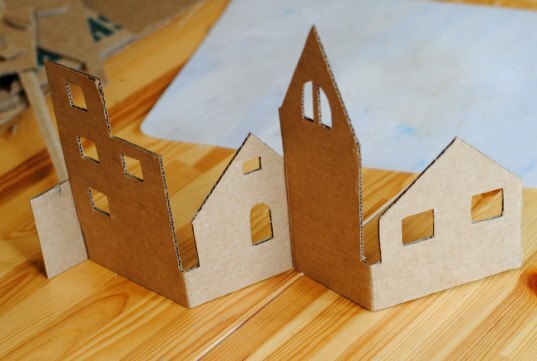 Follow our easy tutorial to design your own custom village scene, with little houses, churches, or even skyscrapers. 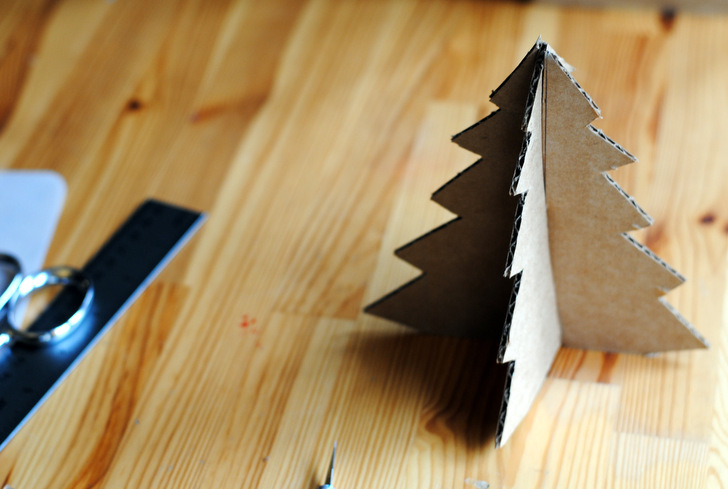 We've also included instructions on how to create adorable tiny Christmas trees from cardboard to create a forest around your village. Next time you receive a shipment in the mail, save the box and read on. Prepare cardboard and sketch out your village. 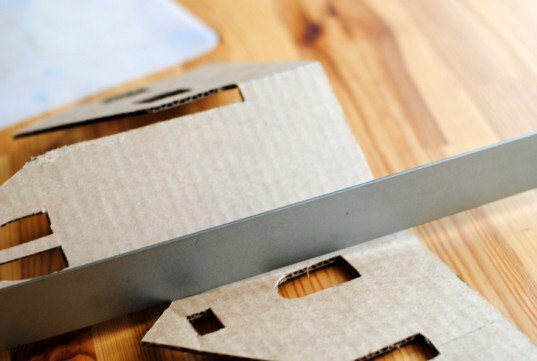 Cut out a nice, large, unblemished section of cardboard from the box, removing any flaps and shipping tape. We used a 20-inch-long section for our village. Using a ruler and pencil, freehand sketch a skyline for your Christmas village—get inspired by checking out photos online, or even add an iconic architectural landmark! 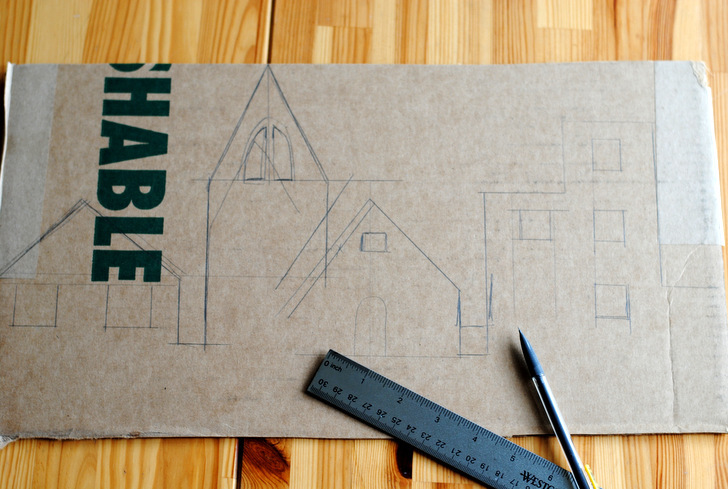 Once you have a rough outline, trace it once more, using the ruler to make sure you have straight lines. Cut out the village. 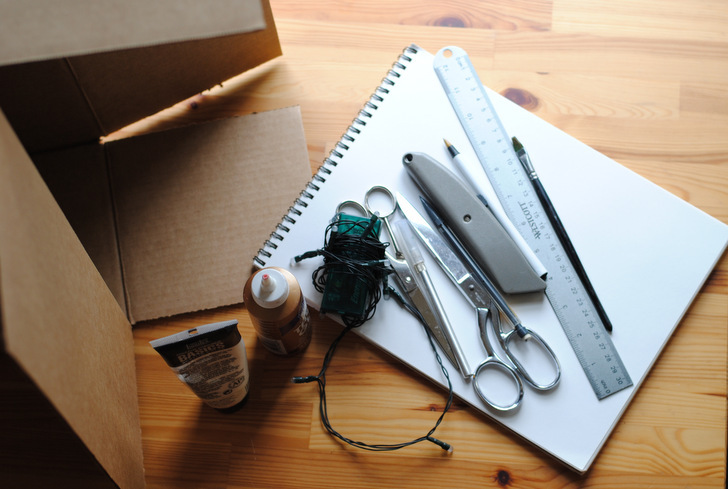 Make the initial cuts with your box cutter and ruler, and use the small utility knife for details like windows. Fold the village. Decide where you’d like to fold your village—the accordion-style fold will help it stand up on its own. 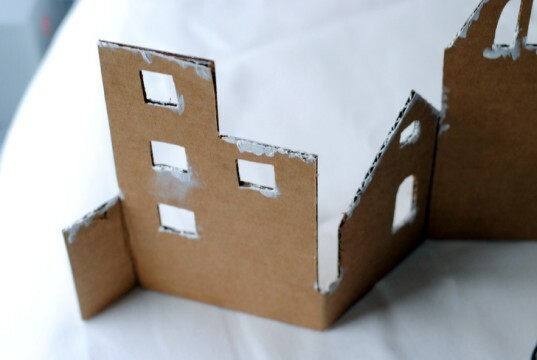 You can fold approximately between each building. Using the ruler, press into the cardboard to score the edge, then carefully fold the cardboard against the ruler to achieve a straight fold. 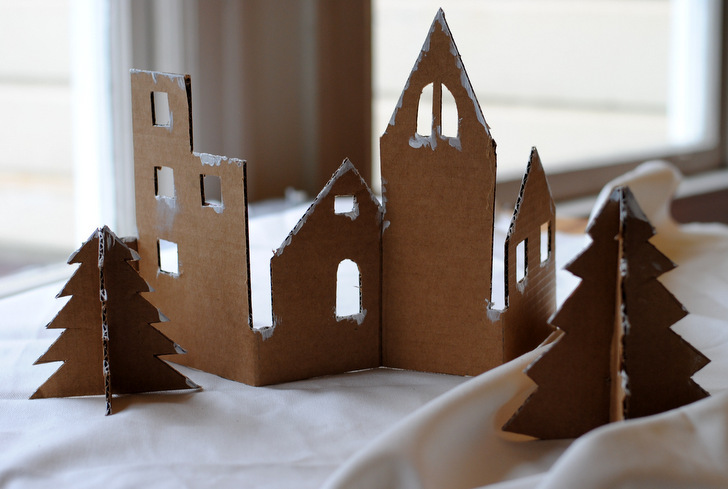 Create your tree template for some wintry woodland accompaniments for your village. Trace a Christmas tree onto sketch paper by folding over an edge, tracing half of the tree, and cutting it out in order to ensure that both sides match exactly. Using the paper template, trace the Christmas tree outline on another piece of cardboard. You’ll need two cardboard cutouts for each tree, and you can create several in different sizes to make a forest! Assemble the tree. Using your utility knife, cut a slit halfway up from the bottom on one cardboard tree cutout, and halfway down from the top of the tree on another. Carefully slot the two halves together to create a three-dimensional tree that’ll stand up on its own. Final touches. Now that you’ve designed and built a Christmas village and a forest, its time to add the final touches. Using a paintbrush, dot white paint along the roofline, windowsills and tree branches to create a snowy effect. You can even sprinkle some iridescent glitter into the paint so it sparkles. When the paint is dry, arrange the village on a white cloth. At night, you can also arrange a set of mini white LED lights behind the windows or use battery-operated tea lights or candles to light up your village! Sketch the village out on cardboard. Step Three: Cut out the village. Using the box cutter and ruler, make the initial cuts. Use the small utility knife for details like windows. Step Four: Fold village. Decide where you’d like to fold your village – the accordion-style fold will help it stand up on its own. You can fold approximately between each building. Step Five: Create tree template. Now create some wintry woodland accompaniments for your village. Trace a Christmas tree template on sketch paper: fold over an edge, trace half of the tree, then cut it out, in order to ensure both sides match exactly. 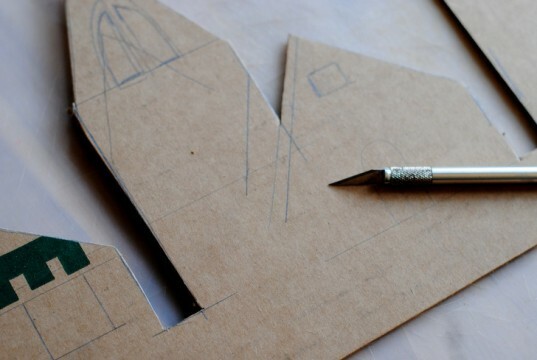 Using the paper template, trace the Christmas tree outline on another piece of cardboard. You’ll need two cardboard cutouts for each tree, and you can create several in different sizes to make a forest! Step Six: Assemble tree. 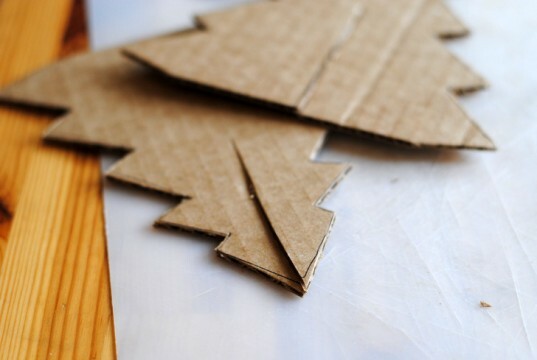 Using the utility knife, make a slit halfway up from the bottom on one cardboard tree cutout, and halfway down from the top of the tree on another. Carefully slot the two halves together to create a tree. Step 7: Final touches. Now that you’ve designed and built a Christmas village and a forest, its time to add the final touches. Using a paintbrush, dot white paint along the roofline, windowsills and tree branches to create the effect of snow. You can even sprinkle some iridescent glitter into the paint. When the paint is dry, try arranging the village on a white cloth. Arrange as many trees around your village as you like! 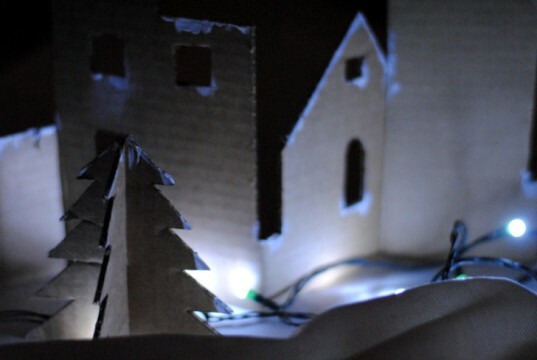 At night, you can also arrange a set of mini white LED lights behind the windows or use battery operated tea lights or candles to light up your village!